The demand for Air Niugini’s services between Port Moresby, Pohnpei and Chuuck, Federated States of Micronesia (FSM) is increasing, ,says the airline’s chief executive officer (CEO) Simon Foo. Foo had remarked when heads from Air Niugini and National Airports Corporation, met with the FSM president Peter Christian, in Port Moresby this week. The three leaders discussed several issues relating to the airline industry, including Air Niugini. 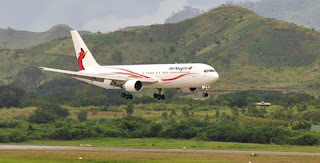 President Christian acknowledged Air Niugini’s service and confirmed his government’s support. NAC acting managing director, Richard Yopo said with the recent upgrade of facilities at Jacksons International airport, it now provides an alternative gateway between the Pacific, Australia and Asia. PNG, as a nation and a good neighbor, in the region, will do all it can to facilitate and increase flights to other Pacific Islands out of Port Moresby, making it easier for passengers to transfer between the major centres of the Pacific, Australia and Asia. Air Niugini commenced flights to FSM in December last year, operating twice a week, every Wednesday and Saturday.